Ideal for large volume order picking. Quantity 3 or more, discount applies (Scroll down for price list). 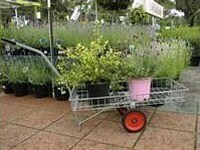 These barrows are easy to use in the home, farm or nursery. 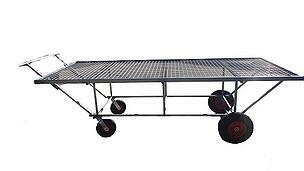 Manufactured from heavy-duty steel and galvanized for all weather conditions and with pneumatic wheels. Our research team in accordance with occupational health and safety guidelines has developed a new 4 wheeled barrow. The new 4 wheeled barrow is very stable, has 2 heavy duty pneumatic tyres and 2 solid swivel wheels which makes it more maneuverable for easy handling. Can have Castor brakes at an additional cost. Comes in flat pack cardboard box for easy freighting. 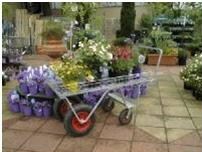 The 4 wheeled barrow has 2 heavy duty pneumatic tyres and 2 solid swivel wheels. Can be fitted with a castor brake, at an additional cost. Easy to use in the home, farm or nursery. Manufactured from heavy-duty steel and mesh, galvanized for all weather conditions.